First of all boil bengal gram lentil with turmeric. When the lentil is done remove from the flame. Take a seprate pan and fry onion in it. Then add green chilies, tomatoes, cumin seeds, fenugreek seeds, crushed red chilies, salt and fry. Add lentil now and fry for few minutes. Now heat butter in a pan add garlic in it and fry. Add cumin. 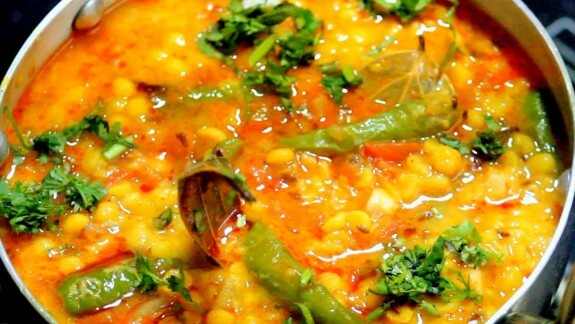 Pour it over cooked channa daal and serve hot with chapati or rice.